St. Paul’s is getting a new rector. This is always an exciting prospect, though one that can be a source of anxiety as well. In any case, a new rector has to come from somewhere, and, for a church such as St. Paul’s, that place is almost always going to be another Episcopal church. And so it is with the Rev. Noah Evans. 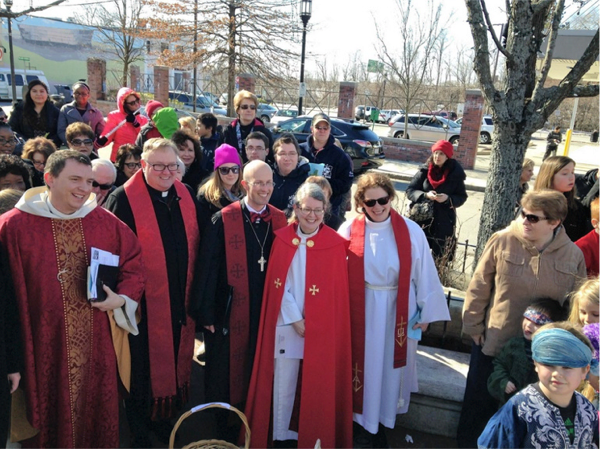 He will be saying good-bye to Grace Episcopal Church in Medford, Massachusetts. Our new rector has written a good-bye message on Grace’s blog, which you can read here. The Medford Transcript carried a story about Evans’ announcement to his church. The story offers some insight into the priest who is coming to Mt. Lebanon. The picture below is from the Medford Transcript story. Although not particularly relevant to the arrival of our new rector, it is worth noting that Grace Church is actually an early, though atypical, building designed by noted architect H.H. Richardson. Richardson, of course, designed the Allegheny County Courthouse and Jail. Grace church, however, looks nothing like the Romanesque Revival style buildings for which Richardson is best known. Information about the Grace Church building is here.